Japan is well known for having a unique variety of food and treats. In fact, nowadays you don’t even have to go to Japan to be able to find a wide range of edibles. In larger cities, you can even find things like Pocky in a simple deli or corner store. There is also no shortage of malls and Asian markets, especially here in the United States, where you can pick up some of these beloved goodies. Indulging in Japanese sweets has been one of my favorite pastimes since I first discovered them in middle school. I soon became known as the kid who could carry an entire second lunch box filled with all kinds of Japanese snacks to school to share with my friends that I would buy in bulk every weekend when stopping by the little Japanese market on the way home from shopping with my parents - Pocky, senbei crackers, "kimono yama" chocolates, and more. I learned even more about them with my first part time job working at a Japanese convenience store, and still more when I finally visited Japan for the first time. Most people are familiar with the snacks mentioned above. Many travelers make it a point to stock up on these to bring home as souvenirs when visiting Japan. However, what about the sweets and treats that don’t get nearly as much publicity as our favorite Pocky? What other kinds of snacks are out there and enjoyed by the locals that we may not have heard of before? What are we missing out on? While living in Japan, I had an opportunity to try to find this out for myself. Now living only a short 5-minute walk from the neighborhood Don Quixote (a popular Japanese department store chain), I used that chance to go in whenever I could to stock up on some new items to try. And of course I was introduced to many other new snacks as well as my time went by, either from my own discovery while traveling around, or by recommendation from friends and fellow visitors. So without further ado, allow me to introduce some of my favorite traditional (and rather unique) Japanese snacks, treats, and candies, that you may not have tried before! Okay, okay, so maybe most people have heard of Kit Kats. Many are probably even familiar with Japan’s unique take on them and wide variety of flavors. But did you know that there are as much as 206 different flavors, many of them limited to Japan? Many people who have visited Japan and tried some of these may rave about green tea Kit Kats, but have you ever tried the sake flavor? Or Wasabi? Or Soy Sauce? These are just a few of the 206 “strange” flavors that the Japanese Kit Kat offers! As if to one-up the Western world on jerky, Japan has a rather interesting take of its own: Big Katsu. Katsu is the Japanese word for “cutlet,” such as in the popular Japanese dish tonkatsu, or fried pork cutlet. Well, Big Katsu snack is the portable snack-sized version of that dish. Now you can carry around your favorite tonkatsu dish right in your pocket! Continuing the fishy trend we have shrimp flavored crackers, just like regular crackers, only... shrimp flavored! While some of these snacks may seem unusual to us, keep in mind that with Japan being as big on seafood as it is, seafood related snacks are a pretty common theme for treats. Also available in potato chip form, think of these as the Japanese version of BBQ chips. I’ll admit, this one threw me for a loop when I first saw it. In fact, I didn’t even want to touch them at first. 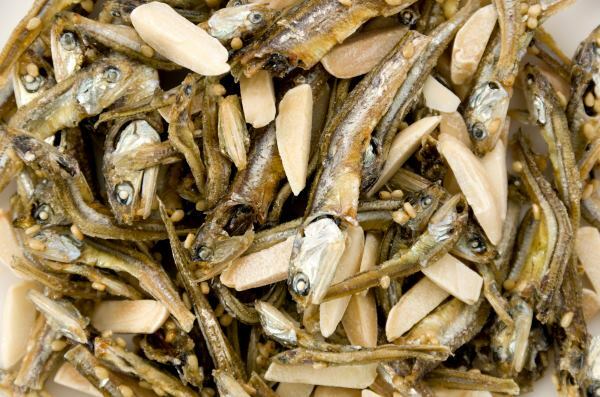 Tiny little sardines, complete with body and eyes, mixed together with slivered almonds. How were all these little kids around me eating so casually? Almond fish were often included as a snack along with the school lunch at the elementary school I used to teach at. I always sat with the kids at lunch time, and it was always fun to watch their reactions to me as I tried a new Japanese food. So imagine the looks on their faces when I tore open the little packet and saw in front of me... little fish eyes! “Eat it Krys-sensei! Eat it, eat it!” The 3rd graders egged me on, and not wanting to disappoint them, I closed my eyes... and popped a handful in my mouth. The room went silence as they waited for my reaction. Probably much to their surprise: “Hey! This is actually pretty good!” Sure it felt weird putting an entire fish, eyes and all, in my mouth, but (and as they so kindly insisted to me when urging me to try it) you don’t notice a thing, especially when paired with the almonds. In my opinion, it’s kind of like a fishy trail mix. I ended up liking this snack so much, I started buying individual packs on my own to take with me to work and munch between classes. The following article touches a bit on the nutrition of this snack, offers some recommended brands, and even includes a recipe to make them yourself! America may have dried out meat snacks like salami and beef jerky, but in Japan they have... dried fish!? That’s right. hoshimono (干物), literally “dried things” come in many forms, but are most commonly seafood items. From fish to squid, to even dried out little crabs that you eat whole (called tamagogani), this is a unique yet popular snack with locals often enjoyed as otsumami (おつまみ), or snacks to enjoy with alcohol, that can be easily found in just about every convenience store. These snacks have gained a bit of popularity recently due to certain health trends that promote the health benefits of seaweed, yet there are still many people who aren’t aware of these tasty snacks. Because they’re super light and have practically no calories, I personally like to munch on these when I want to satisfy a salt craving but don’t really want to eat a whole snack. They also commonly come in soy sauce and wasabi flavor, and along with being yummy treats they also make a nice addition to a bowl of rice. Wagashi (和菓子), meaning Japanese snacks, is a term that refers to several different kinds of traditional Japanese sweets and confectionaries made in a traditional Japanese style. These are completely plant-based and dairy-free, and used to be comprised mainly of fruit (hence the kanji for the word ‘fruit’ being included in the word for ‘wagashi’). Most wagashi have a rather long history, and beginning with simple traditional fruit and nuts, evolved as the country expanded and incorporated new ingredients and methods learned through trading missions with other nations. This is a specialty of Nagasaki, but can be found all over Japan. Castella is a kind of sponge cake, and it is named after a Portuguese bread which was brought into Japan when the Portuguese missionaries arrive in the 16th century. They are now also available in other flavors like green tea and honey. A round confectionary shaped like a small bun with the outer dough made from flour, buckwheat, and kudzu (Japanese arrowroot powder), and filled with a sweet paste, usually red bean paste (anko), and sometimes chestnut paste. These are little mochi cakes usually filled with anko paste. They are often made in sold in colorful little bunches of white and pastel pink and green. While this is the traditional and most common style of daifuku, they now come in many different varieties, flavors, and fillings. This is a kind of sandwich-like sweet made with two small castella “pancakes” with an azuki bean filling. One of the most popular type of Japanese traditional sweet, especially with tourists, dorayaki are very easy to find in just about any convenience store. I actually discovered these before I even visited Japan when I used to work in a small Japanese grocery store in the city. A Japanese woman came in with her kids, who were both eating the cutest fish-shaped cakes I had ever seen! I asked her, and she explained to me about taiyaki. Tai is the name of a kind of Japanese fish, which is what these cakes are shaped and named after. They can be filled with many kinds of ingredients and range from sweet to savory: azuki and chocolate are common, but they can even be filled with cheese or sausages! This is a thick jelly-like snack made from red bean paste, agar, and sugar. Originally a Chinese snack made from gelatine (which is made from animals like sheep), it was adopted into Japan and the recipe revised with the introduction of Buddhism to replace the animal-based gelatine with plant-based ingredients. These are cute and delicious triangular shaped confections made with a sheet of glutinous rice flour (similar to mochi but not as thick), and filled with red bean paste. It is usually also dusted in cinnamon and sugar for sweetness. Often sold as a popular souvenir sweet, yatsuhashi is a particularly famous treat of the Kyoto region (and one I always make sure to buy in bulk when I visit!). Unlike the snacks above which are mostly soft and cake-like, karinto are deep-fried, crunchy rolls made of flour, yeast, and brown sugar. They are also very popular in Okinawa, where brown sugar is one of the local specialties! There are so many different kinds of wagashi, it would be difficult to name them all here, but they were definitely a part of my life in Japan that I enjoyed learning more about. If you ever get the chance, by all means, try as many of them as you can! Sushi? Yakitori? That's so mainland. Learn about Okinawa's own unique style of food. A judo champion leaves a room full of reporters in shock with her plans for the future. While Subway stores in Japan shutter left and right, Starbucks thrives. Why has the one failed where the other succeeded? Japan is considered synonymous with rice. So why has consumption decreased steadily for decades? You don't need to know Japanese to appreciate good food. Here are some of the hashtags that people use to post about the scrumptious stuff they're eating.